How do I disable the irritating owl pop-up? 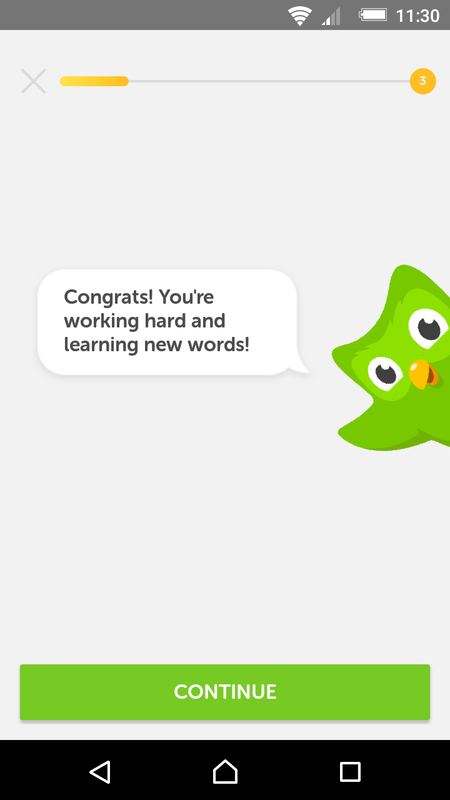 Duo has now decided to interrupt the lessons with an irritating owl pop-up exhorting me to keep up the good work. This wretched and annoying "improvement" is very off putting and a distracting waste of my time and patience. It would be bad enough if it was at the end of a lesson but no, the accursed thing sticks its beak into the middle of the lessons instead. I have looked in settings but there appears to be absolutely no way to turn the creature off. I don't know who thought that compulsory pop up cartoon owls interrupting lessons was a good idea but I think they missed their turning as a kindergarten teacher. If this is an example of the great and exciting improvements we are getting in lieu of immersion, it is a very poor substitute. Any help to get rid of the incubus would be greatly appreciated. Thanks. @KenBookmye Sadly, that was what I had feared. If this continues the site will be pretty much unusable from my perspective. I can't believe how far downhill it has gone in such a relatively short time. The metrics probably show an uptick in engagement, but then they still appear for somebody doing exercises every day. I don't really see the point of that, I do personally find it annoying. May I ask if you have had the unmitigated pleasure of it interrupting your lessons, because if you haven't let me tell you, its "cuteness" wears off very quickly indeed. I have to admit that I've only had it pop up about 3 times, so it might get annoying eventually. DUOLINGO, WHAT ARE YOU DOING Remove that stupid (ok, not stupid...) owl!!! Thankfully now there is the option to remove the owl pop-up. However the ads are still frustrating but thankfully the strength bar is back rather than the timer. I have definitely used the app less since the changes were made, and still haven't really used it as much as I used to. Would you mind sending instructions for getting rid of it? I can't find them. The owl fly into my phone a little over a month ago. It has nearly turned me away completely from using my phone for practice. Only in very rare circumstances will I use the mobile app. It becoming quite intolerable between the interrupting owl, the ads after each session, and the constant sales tactics to "repair my streak". No thank you. I'll stick to PC. Is there any way to suggest that if you are over a certain age/grade it could be automatically Disabled? I was already getting pretty bored with the repetitive nature of the exercises but this irritating owl is the final straw. I am only sticking it out because of an idiotic aim to get to 1000 day streak. Sad isn't it. I am an educator and I actually like the pop up owl very much. It is a great encouragement especially for the younger learners. @Ifphigenia :) Yes, optional makes sense if that is so. I would like to support getting rid of this extremely annoying feature. It started for me about a week ago. There is a comment saying that we can now get rid of it. Does anyone know how? I too agree. Please give us an option to not have the little green owl. Totally agree, it drives me nuts! Every time I start a lesson, I'm fuming, because I have to wait 10 to 15 seconds while the frigging owl ❤❤❤❤❤ about! how to disable the timed practice? How do I disable multiple choice? Disable transitions in iOS app? Duolingo admins! Please allow users to disable crowns. How do I fill in my 3rd Bonus Skill?